I often give advice about nutrition, and I like to think of it not just in the narrow sense of food for the body but in the broader sense of what we choose to experience and how the choices affect our minds and emotions. Awesome. Just awesome. Because I really believe that where I put my eyes and my attention pretty much determines what I see and experience, and thus where I tend to dwell in in my head and the emotions that bubble up to the top of my life. I believe this because, well, I live it. A bunch of years back in a whole other lifetime I hung around with a really great person who used snarky, biting (and, yes, funny) criticism of everyone and everything else to basically help him feel better about himself. He pulled things and people down so he’d feel taller and better. 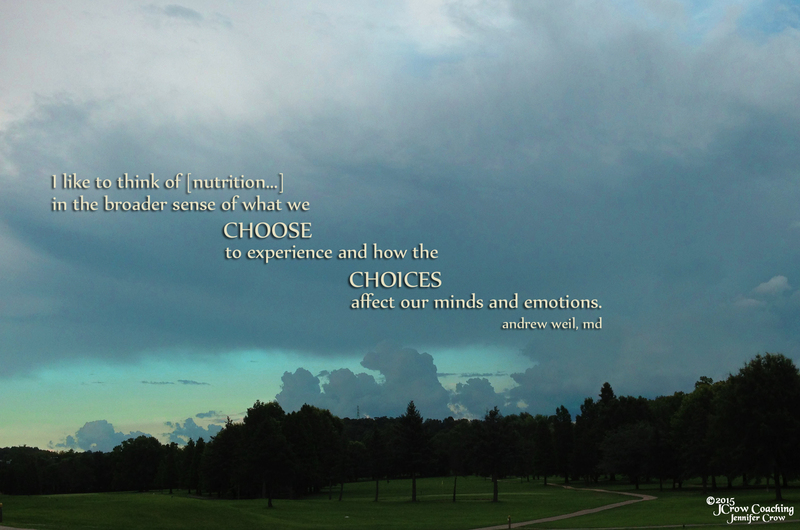 As Dr. Weil says, what we choose to experience affects our minds and emotions. I fell into that mode, too. A few years ago I made a conscious shift to cultivate gratitude, to look for the good in any situation (even crappy, hard ones), and to focus on being more positive. I changed my diet of experiences and focus, and, wow, did those choices pay off. Today, then, I’m really grateful for stumbling across this magazine at a most unlikely place and for the whim that nudged me into buying it. Even more, though, I’m grateful for having improved my experiential nutrition so much that I recognize the truth in these words.